one of the UKs best fireworks events! 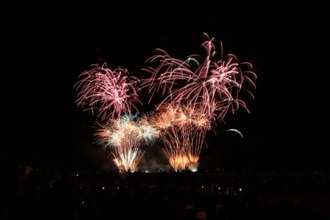 Ragley Hall in Warwickshire is to host the Fireworks Champions on Saturday 10 September. Although the event is in its 14th year, this is the first time that it has been staged at Ragley Hall. Three of the UK's best firework companies compete against each other with a 10 minute firework display choreographed to music. The audience selects their favourite display by text and the results are announced later in the evening. Visitors are encouraged to bring along a picnic, soak up the atmosphere and enjoy the music and interviews. Food and drinks can be purchased at the event. Fairground rides are available for children. Gates open at 5pm and a lesson in pyro musical choreography takes place at 9pm when the organisers fire various fireworks and discuss over the PA system how they work and where they are used. The three competing teams then perform their displays from 9:30pm. Team 1 is Atom Fireworks from Manchester, Team 2 is G Force Fireworks from Evesham and Team 3 is Phenomenal Fireworks from Wigan. The closing display at 10:30pm is by organisers MLE Pyrotechnics. Hilary Philpott, House Manager at Ragley Hall stated "We are delighted to host the Fireworks Champions on Saturday. With the stunning backdrop of the magnificent hall, gardens and lake, Ragley Hall provides the perfect setting for watching one of the best firework events in the UK".